Have been doing an exceptional job at work? Looking for ways to get that job promotion, but at a loss on how to convince the boss? Everyone hopes for advancements in their career, so expecting for a promotion is of course nothing new.Getting paid high may come in secondary to getting a promotion. Promotion is, in fact, an acknowledgement or recognition of a job well done or the achievements of the employee. Even then, to ask for promotion takes a lot of planning and thought. A lot of preparation is required before meeting up with the boss, in an attempt to persuade him of the necessity to propose the promotion. 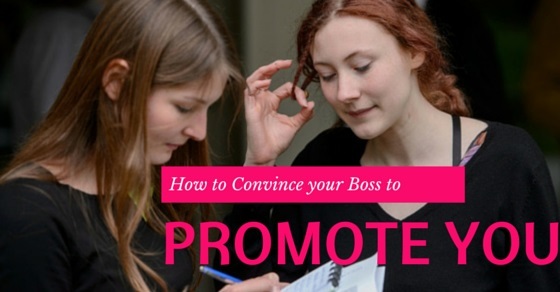 In the article, we will take a look at some tips which will help you while asking for a promotion and help to convince your boss. The following mentioned are few tips on how to ask for a promotion at work and be promoted. Asking for a promotion in the spur of the moment, without any proper backup plan to support the claim is a definite no go. The employee needs to have a proper plan in place. Begin by informing the boss about the work that has been done, the achievements and successes. The boss definitely needs to know that the person has done his work very efficiently till date. Prepare the list of achievements to present to the boss for the conference. Give explanation on how this helped in the growth of the company. Be sure to mention the skills and capabilities along side. Asking for a promotion is well and good, but the employee needs to have a specific idea about the post that he/she wants to hold. Understand the role that they would have to adopt, if they ever get promoted. See what the responsibilities are and how one would contribute to the success of the company and its future growth, if ever promoted. The person will have to convince the boss that they are efficient and capable enough to hold that position, if they ever get a promotion. They could as well cite an example of how they managed similar role of small scale at an earlier time and are quite ready to accept bigger challenges. One can’t just walk up to the boss and ask to promote them just randomly, at whatever time they like. On the other hand at the annual or quarterly reviews when everyone’s work is ready to be analysed, one can expect to extol their work and achievements to the boss, thus hoping to get the promotion in recognition of work well done. At the same time, if everyone is going through role change within the company, then it is the perfect time to ask for promotion. However, if the company is suffering from loss of money or have lost some good deal, then definitely refrain from asking for promotion. Check to see if the boss is in good temper before approaching him about promotion. One thing to know is that to speak with the boss on matters of promotion to you or salary raise, you need to be at ease with him. It will be better if one can establish a close acquaintance with the boss or manager, so as to have easy access to him when it is time. Recognize what the boss expects as well as his contribution towards the success and growth of the company. This would aid the worker to do the best. Well now, the time is right and the plan is all set. First, ask for a meeting with the boss. Send out mail or fix up prior appointment to speak about achievements and further expectations from both ends. Basically, send out feelers to him about the expectations from the meeting. Do not set out to blindside the Boss or Manager. Never ever approach the boss with the over confidence that a promotion is well deserved. Do not expect reward or appreciation in the form of promotion for a job well done. The achievements and success in all endeavours with regard to work in no way translates to raise or promotion. Once that fact is accepted, the conversation with the boss would be so much easier. Be open to accept rejection. Elaborate on the reason why one should get promotion. Then carry on and develop the skills, as they could come in handy while assuming the new responsibility. Be aware of an issue and emerge with pioneering solutions. Be the person, everyone can approach for everything. Always excel beyond expectations in the current position. Try and learn from the boss or manager. It could be that the employee has done great job till date. His achievements and success stories are by dozen and the boss is happy with the progress till date. In such cases, chances of promotion opportunities are high when asked. However, at certain times he might also expect more from the employee. Always, enquire with the boss, on how to improve in case the boss denies promotion at work at any point of time. Continue with the excellent job and achievements, hoping to earn the promotion at a later date. Each employee is different, their expectations and achievements totally different from the other. For this reason, expecting everyone to be the same is not possible. One thing to consider is that whining about promotion of a colleague with lesser experience or qualification is a definite no. Try do the work given efficiently and don’t spend time analysing some one else’s promotion. There could be some other rationale behind it. Be ready to give the appearance of a mature person, ready to meet the challenges one could encounter in the new role. In the conversation with the boss, about promotion, talk about the company, its achievements and development till date. Go on to discuss about the future plans of the company and how to chip in towards its expansion and so on. Company and its growth should be put first. Begin by putting on the table the achievements and the success stories. However, do not discontinue with that. Continue to talk about most recent ideas and concepts put forth. See what would help in the growth of the revenue and expansion of the company. Make sure to provide ideas that would help with it as well as which would make the job easier for everyone. During the meeting, be sure to ask for feedback from the boss on the achievements and successes. See what he thinks of it, or how to improve on it. Try to understand his viewpoint on granting the promotion. It should be a mutual discussion and not a one man show to deliver a speech on the successes, thus expecting to be granted the promotion. However, if that promotion is not given do not be offended. Work hard to achieve better and hope to get it at a later date. One thing to remember is to check with the boss on the development once a while. Boss would also be convinced that more responsibility is definitely expected. Be aware of what to expect. Never ask for more than expected. Achievements and hard work alone will not ensure a promotion. Have a better understanding of the inner politics within the company as well as other corporate culture or policies that could help get the promotion. Do not overlook the long-standing career aims in the pursuit of promotion. Do not butter up or resort to flattery with the boss, expecting to get the promotion. Other thing to consider is to maintain peace with everyone. Never in an attempt to make an impression on the boss, overdo things or do job intended for the manager. Try to do the expected work and to complete it before time. Just because it’s been long enough with a company, never expect the promotion. Finally, never ever try and negotiate for promotion with pressure. Not everyone goes with the expectations while asking for a promotion. Many make mistakes, which however can be easily overcome with time. Never feel disheartened at the mistakes made. Always be professional, while speaking with the boss. Do the job well and never press the boss incessantly. One can always assume that the answer is a ‘no’, when the boss does not give any answer, within a specific period of time. At the same time, one can try and understand the reason why for the rejection. Try and speak with the boss and see what could have been done better to land that promotion. Keep calm whilst speaking with the boss and try harder to do the best and get the promotion at a later date.